Sweet River Abattoirs Limited (SRA) Audited financials for the year ended March 31, 2018 reported revenue for the twelve months ended March 31, 2018 of $304.41 million, a decrease of 12% compared to the $345.12 million booked for the corresponding period in 2017. Revenue for the quarter declined by 26% compared to the corresponding quarter in 2017 to $64.98 million (2017: $88.15 million). Cost of Sales fell by 13% over the twelve months moving from $294.03 million in 2017 to $256.45 million in 2018, resulting in a gross profit of $47.96 million (2017: $51.09 million). For the fourth quarter, gross profit amounted to $3.88 million, a significant decline of 75% when compared to the previous year’s comparable quarter of $15.36 million in 2017. Administrative expenses increased by 348% to $165.63 million for the twelve months ended March 31, 2018 relative to $36.96 million for the same period of 2017. For the quarter there was also a surge in administrative expenses compared to the comparable 2017 to $131.25 million (2017: $10.80 million). Finance cost increased 58% to close at $20.13 million (2017: $12.75 million), whilst finance income saw a 110% increase from $18,203 in 2017 to $38,139 for the financial year 2018. Net profit for the twelve months saw a drastic deterioration from $1.39 million in 2017 to a net loss of $113.15 million. Net loss for the fourth quarter totalled $108.98 million compared to the profit of $719,310 reported for the previous corresponding quarter. This was mainly attributable to an ‘Impairment of Property Plant & Equipment’ of $78.10 million and a ‘Bad Debt Written Off’ of $38.82 million. Loss per share (LPS) closed at $1.39 for the year relative to an earnings per share of $0.02. For the quarter, LPS totalled $1.34 as compared to an EPS of $0.009. The numbers of shares used in the calculations are 81,531,043 units. 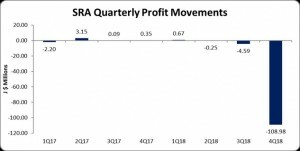 SRA stock price closed the trading period on September 26, 2018 at $3.86. As at March 31, 2018, the company’s assets totalled $412.64 million a 17% decrease compared to the $496.17 million booked as at ended March 31, 2017. ‘Property, Plant and Equipment’ and ‘Trade and Other Receivables’ contributed to the overall decline to close the year at $330.49 million (2017: $386.87 million) and $20.62 million (2017: $53.17 million) respectively. ‘Deferred Tax’ tempered the overall decline with a large increase to $27.91 million (2017: $3.24 million). Shareholders’ equity amounted to $49.16 million as at March 31, 2018 (2017: $162.31 million) resulting in a book value per share of $0.60 (2017: $2.00).